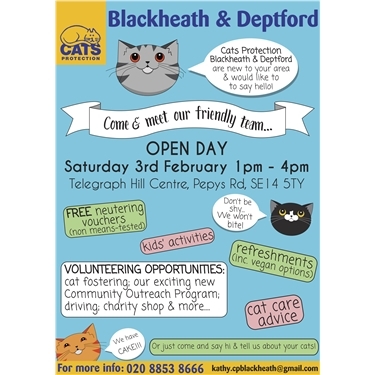 Cats Protection Blackheath & Deptford are holding an open day on Saturday 3rd February between 1pm - 4pm at the Telegraph Hill Centre, Pepys Rd, SE14 5TY. We're keen to introduce ourselves to the area and would really like to forge links with the local community. So please pop in if you'd like to hear about our plans, and maybe find out about volunteering with us. For those looking for hands-on cat work - we REALLY need cat fosterers. For the more people-oriented, we hope to launch a big community outreach project this year to encourage more people to take up our free cat neutering vouchers. To achieve this we'll need to put together a team including education speakers, leaflet deliverers, drivers and people willing to knock on doors and speak to cat owners - none of these roles require a regular commitment, and can be carried out as and when you have spare time. We're also looking for shop volunteers at our charity shop at 18 Old Dover Rd, SE3 7BT. But you're more than welcome to come along just to say hi - we'll have cat care advice and neutering vouchers available, kids' activities and refreshments, inc lovely home made cakes! Looking forward to meeting you!